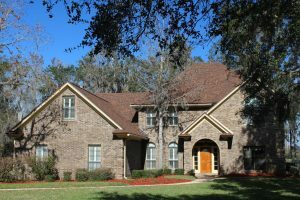 Come see this beautiful red brick home that sits on over 3 acres of land. This property zoned agricultural and would be perfect for horse owners. 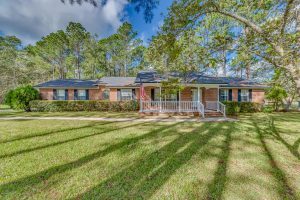 Enjoy the peace of country living while still being close to the city. The home was recently updated, with brand new kitchen tile, dishwasher, stove, microwave, and updated bathrooms. kick back and enjoy the Florida weather in the screened in patio over looking the back yard. A new roof and water softener were in installed in 2017, and the septic tank was serviced as well. WOW! Just beautiful! Fantastic Lot & Location! The East Hampton community is highly desirable & this is move-in ready. Highlighted features include new flooring throughout, spacious living, family & dining rooms, decorative detail with staircase spindles/wainscoting/wood moulding/glass tile kitchen backsplash, Wood-burning fireplace, updated lighting & plumbing fixtures throughout, new saltless Water Softener, updated master bathroom w/ tiled/seamless entry shower. 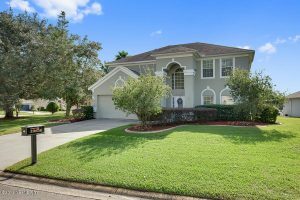 30’x10′ screened lanai, & exterior with sprinklers on own well, huge lot with plenty of room for a pool, landscape curbing & the list goes on! Fabulous amenities include pool, tennis, basketball, playground, & soccer field. Close to everything! Too much to mention here. Come see for yourself. You won’t be disappointed!